I know I haven't undated since my VoxBox post, but as much as this kills me, I'm trying to ween myself away from always having my nails polished. Starting November 6th, I'm taking classes to become a licensed esthetician! Not a lot of people know this, but before I ever got obsessive about nail polish I hugely into makeup. Freshmen year of high school, my dream was it become professional makeup artist. Things changed, I got tired of my makeup collection and moved on into polish. I really had no clue that I'd choose to go to school to learn about skincare...and makeup. Anywhoos! Here's what I'm wearing. 2 coats China Glaze Adventure Red-y and 2 coats of SOPI It's Real! 18k topcoat. 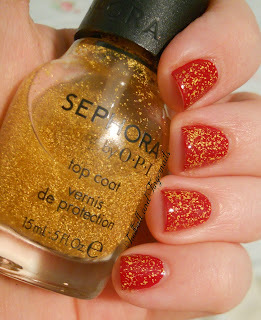 I think I'm the only one who's in love with the small gold flakes in this opposed to the flakes in the Zoya or OPI version!